The Pope has said that minorities need to be protected but wants the UN to be involved. Pope Francis said that this was a case of unjust aggression. POPE FRANCIS HAS endorsed the use of force to stop Islamic militants from attacking religious minorities in Iraq. He has said however that the international community and not just one country should decide how to intervene. Francis also said he and his advisers were considering whether he might go to northern Iraq himself to show solidarity with persecuted Christians. But he said he was holding off for now on a decision. 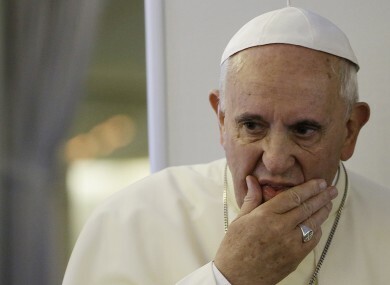 Francis was asked if he approved of the unilateral US air-strikes on militants of the Islamic State who have captured swaths of northern and western Iraq and northeastern Syria and have forced minority Christians and others to either convert to Islam or flee their homes. But, he said, in history, such “excuses” to stop an unjust aggression have been used by world powers to justify a “war of conquest” in which an entire people have been taken over. His comments were significant because the Vatican has vehemently opposed any military intervention in recent years, with St. John Paul II actively trying to head off the Iraq war and Francis himself staging a global prayer and fast for peace when the US was threatening air-strikes on Syria last year. But the Vatican has been increasingly showing support for military intervention in Iraq, given that Christians are being directly targeted because of their faith and that Christian communities which have existed for 2,000 years have been emptied as a result of the extremists’ onslaught. The US began launching air-strikes against Islamic State fighters on 8 August, allowing Kurdish forces to fend off an advance on their regional capital of Irbil and to help tens of thousands of religious minorities escape. Church teaching allows for “just wars,” when military force can be justified under certain circumstances. And in recent days, a few Vatican officials have edged increasingly toward acknowledging the Iraq situation fits the bill. Francis sent a personal envoy, Cardinal Fernando Filoni, to northern Iraq last week with an undisclosed amount of money to help people in flight and show the Pope’s solidarity with those forced to flee their homes. Email “Pope Francis has endorsed the use of force to stop Islamic militants in Iraq”. Feedback on “Pope Francis has endorsed the use of force to stop Islamic militants in Iraq”.